Re-Spiced: A Silk Road Cabaret isn’t your mother’s cabaret. It’s bold, colorful, eclectic, relevant and shockingly subversive. I’ve seen a lot of cabaret in my time, but nothing quite like the experience I had last night. 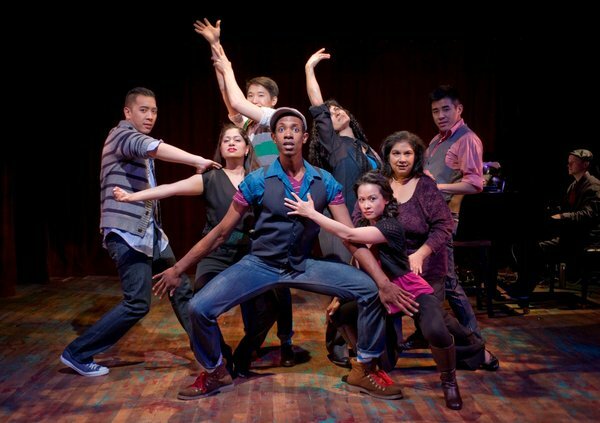 The brilliance in Re-Spiced, which is devised by Jamil Khoury, directed by Steve Scott and produced by Silk Road Rising, is that it pairs a decidedly diverse (read: non-white) cast with songs describing their culture, ethnicity and religion — songs, mind you, that have been written by mostly white, male composers. It’s an outsiders’ perspective performed from the inside out. And the songs range from standard musical theatre fare (South Pacific, Kismet) to rock and rap (Weezer, Ice Cube and Bob Dylan, to name a few) to the obscure. Indeed, a melting pot of melodic inspiration. I mean, when you take a song like “Korean Parents,” written by Randy Newman, and have it performed by the droll (and Asian) Joel Kim Booster, you can’t help but smirk. Don’t get me wrong: these performers don’t mock the material; rather they perform it with a sly understanding. The connective tissue between these songs and cleverly arranged medleys (Ryan Brewster provides music direction) are thoughtfully chosen passages from various authors, including Walt Whitman, Victor Hugo and Friedrich Nietzsche. Did I mention the dancing? Award-winning choreographer Brenda Didier puts this cast through their paces, and the group numbers, which include songs like “Walk Like an Egyptian” and “Rock the Casbah,” give the evening a polished flair. My only advice? While support from the two onstage musicians (piano and guitar) is solid, they need to drop the hallow-sounding drum machine that clicks along to some of the more up-tempo numbers. The heartbeat of this show should be supported by a real, live drummer — not a computer.